On 7 February 2018 Bitcoin Wednesday is proud to include Gabriel Kurman, co-founder of RSK, on its program. RSK, also known as Rootstock, is one of the first Turing-complete blockchains that enables smart contracts secured by the Bitcoin network through drivechain and merge mining technology. RSK allows Bitcoin to scale and add smart contract functionality. Gabriel will give both an overview and a deep dive into RSK’s innovation with drivechain and merge mining, and explain what it brings to the industry. A blockchain is said to be “Turing complete” when it can run software that can potentially solve any computational problem. At the heart of RSK’s solution is a Turing Complete Virtual Machine known as the RSK VM integrated with the Bitcoin network. This mechanism allows the computer network to operate decentralized self-executing applications known as smart contracts which have been integrated with Bitcoin. Bitcoin includes a powerful scripting language that adds a variety of features. One of the best-known examples is the multi-signature transaction, a kind of conditional payment that can only be completed if it has been authorized by, say, a majority of stakeholders. For the sake of security, Bitcoin script has no loops and is not Turing complete, as defined by its reference implementation. RSK extends Bitcoin’s functionality by transforming bitcoins into “smart bitcoins”, tokens that can be used within self-executed, decentralized applications, similar to Ethereum’s d’apps. In fact, RSK smart contracts are programmed in the same Solidity scripting language used on the Ethereum network, so RSK can be said to make Ethereum smart contracts compatible with Bitcoin. In time we might expect this technology to lead to an array of Bitcoin-based crowd sales and ICOs. It enhances the security of the side chain which it can inherit from the main chain. It can improve scalability of the main chain by supporting features like micropayments on the side chain. It can safely allow for experimentation on the side chain so that potential bugs and other risks (i.e. lack of liquidity and high volatility) would not effect the main chain. Anyone who has followed the criticism of Bitcoin related to high transaction fees when the network is congested, lack of scalability, and excessive energy consumption, or any of its other shortcomings, might appreciate the ability of side chains to allow for much more innovation in the Bitcoin ecosystem. A drivechain is an implementation of the side chain concept that extends and potentially improves the consensus mechanism. Drivechain nodes assemble blocks and pay themselves just as miners do in the Bitcoin network. However, the drivechain concept assumes, or rather requires, that anyone running a side chain node can efficiently buy proof of work from miners on the main chain with tokens (i.e. bitcoins) from the main chain. In this scenario, miners get paid directly with bitcoins, and help to secure a side chain without having to process transactional details from that other chain. Merge mining is the mechanism that allows one blockchain to depend upon the hash rate of another: For example, a bitcoin miner can simultaneously apply the same processing power to a secondary chain for no additional cost. For example, when he mines bitcoins, he can also receive namecoins. A drawback to this type of mining is that it requires miners to give up bandwidth in order to receive transactions from the merge mined chain. “Blind” merge mining aims to resolve that issue by compensating miners in tokens from a main chain for the transaction processing power they deliver to a secondary chain. This approach has the added benefit of not requiring the miner to run any software for the sidechain. Nodes on the sidechain can simply pay miners of the primary chain for their proof of work. 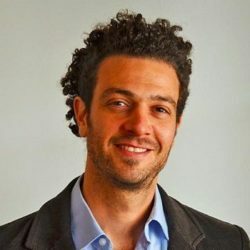 Gabriel Kurman is a co-founder of RSK Labs. He studied economics at the University of Buenos Aires, and has more than a decade of experience in corporate and private equity as well as M&A. He also previously worked for Monsanto. Gabriel Kurman is a co-founder of RSK Labs, also known as Rootstock, one of the world’s first, Turing-complete blockchains that enables smart contracts secured by the Bitcoin network. Gabriel is an economist who studied with at the University of Buenos Aires and has a decade of experience with corporate and private equity and M&A.